This Pampered Chef recipe for Creamy One-Pot Pasta has been on my radar for months. I finally made a half batch for dinner last weekend and am so glad I did. It’s definitely a keeper – quick, easy, healthy and delicious – perfect for a busy weeknight or weekend dinner. This is a great light vegetarian dish. For a heartier version, you can add sliced grilled chicken breasts or sliced grilled turkey sausage. Of course, I ended up making several changes to this recipe based on what I had on hand and to boost the vegetable to pasta ratio. I used farfalle instead of penne, a blend of broccoli, pea pods and carrots instead of just broccoli and carrots, and added both sun-dried and cherry tomatoes, instead of just one or the other. I also grilled two links of Aidell’s Italian style chicken and turkey sausage with mozzarella, sliced them and stirred them in right at the end. Delicious. With my changes, each serving has just 290 calories and a Weight Watchers PointsPlus Value of *8. Under the new Freestyle Program, this is now *9 WW Freestyle SmartPoints. If you’ve made this light & creamy vegetable pasta, please give the recipe a star rating below and leave a comment letting me know how you liked it. 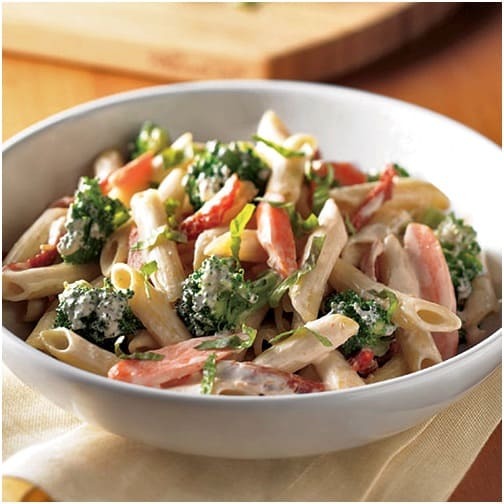 A quick and easy one-pot pasta with fresh vegetables in a light cream sauce. Place garlic and oil in a large saucepan. Cook over medium heat, stirring often, until garlic is golden, 2-3 minutes. Add broth, cover the pot and bring to a boil over high heat. Stir in pasta, cover and simmer vigorously, stirring occasionally, until pasta is almost cooked but still firm, 8-10 minutes. Add the vegetables and cream cheese to the pot of pasta and stir until the cream cheese is melted. Reduce heat to medium; cover and cook 3 to 5 minutes longer, until vegetables are crisp-tender. Serve immediately, garnishing with Parmesan and fresh basil if desired. If you add 2 links of Aidell's Italian Chicken & Turkey Sausage with Mozzarella: 375 calories, 16 g fat, 39 g carbs, 2 g fiber, 19 g protein, *10 WW PointsPlus, *11 WW Freestyle SmartPoints. I added 1 cup of sliced pea pods to the broccoli, carrots and tomatoes and then grilled sliced Italian style chicken sausage at the end the last time I made this recipe.